Revenue in the Electronics & Media segment amounts to US$110,164m in 2019. Revenue is expected to show an annual growth rate (CAGR 2019-2023) of 4.7%, resulting in a market volume of US$132,554m by 2023. The market's largest segment is Consumer Electronics with a market volume of US$76,998m in 2019. Reading Support Revenue in the Electronics & Media segment amounts to US$110,164m in 2019. Reading Support The Electronics & Media segment is expected to show a revenue growth of 6.0% in 2020. Reading Support In the Books, Movies, Music & Games segment, the number of users is expected to amount to 195.5m by 2023. 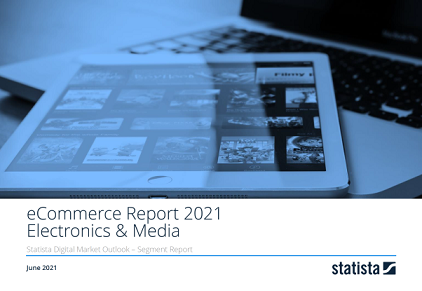 Reading Support User penetration in the Electronics & Media segment is at 82.1% in 2019. Reading Support The average revenue per user (ARPU) in the Books, Movies, Music & Games segment amounts to US$236.27 in 2019. The following boxes show the top 5 online stores by eCommerce net sales (first party sales) in the Electronics & Media segment in United States. Data basis for net sales and market share are company surveys, annual reports and a complex sales forecast model developed by Statista. Reading Support In the year 2017 a share of 27.2% of users is 25-34 years old. Reading Support In the year 2017 a share of 51.4% of users is male. Reading Support In the year 2017 a share of 35.4% of users is in the medium income group.